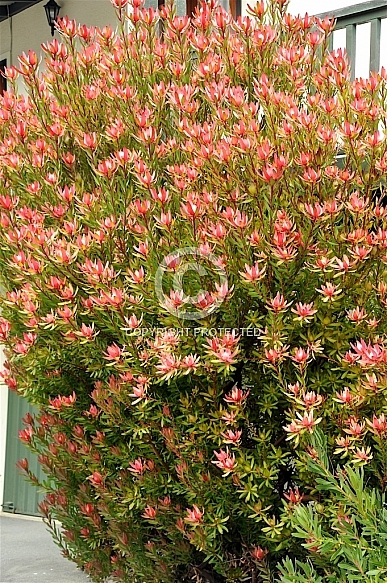 Description: Without doubt, ‘Safari Sunset’ is the most widely cultivated leucadendron and arguably the most successful proteaceous cut flower to date, with literally millions of stems being grown in several countries as an export crop. This has been the case for the past 35 years or more and little has changed over the years. A New Zealand raised hybrid cultivar by Ian Bell dating to the early 1960’s, this deliberate cross of L. laureolum x L. salignum (red form) proved the significance of hybridising to the protea industry. If left un-pruned or not picked, ‘Safari Sunset’ will become a 3m tall somewhat straggly bush. Heavy picking or a disciplined yearly pruning is essential to maintain a dense, bushy habit. The very rich, deep red bracts form on exceptionally long stems from late summer, and during late autumn and winter are at their peak for picking purposes. From late winter into spring the bracts spread open to reveal a cream inner, and at this stage are sometimes marketed as ‘rainbow’ or ‘tri-color’ leucadendrons. The combinations of strong colours, extreme stem length (often over 1m), prolonged vase life and lasting qualities for shipping purposes have provided a cut flower grower’s dream plant. Most well drained soils suit ‘Safari Sunset’, but full sun is essential to achieve maximum bract colour. It is normally frost hardy to about -6 ºC.